Short history of commercial fishing vessels. From lighthouses to shipwrecks, Michigan is rich in maritime heritage tradition; yet the importance of Great Lakes fisheries as part of our maritime heritage landscape is often untold. Fish have been a critical source of good protein for the people living along these shores for thousands of years. Great Lakes fish and fishing for sustenance, and tribal, commercial, and recreational fishing have shaped the culture, economy, and quality of life for people in the Great Lakes region. At the peak of commercial fishing in the Great Lakes 150 million pounds of fish were being harvested annually. Today, Great Lakes commercial fishing operations sustainably harvest over 40 million pounds annually, between the United States and Canada, providing a significant food source shared around the world. Industry Innovations and Evolution Fisheries heritage stories are often reflected in (and aboard) the fishing boats that carried fisherman to the fish; and these critical fish harvests home to our coastal communities. 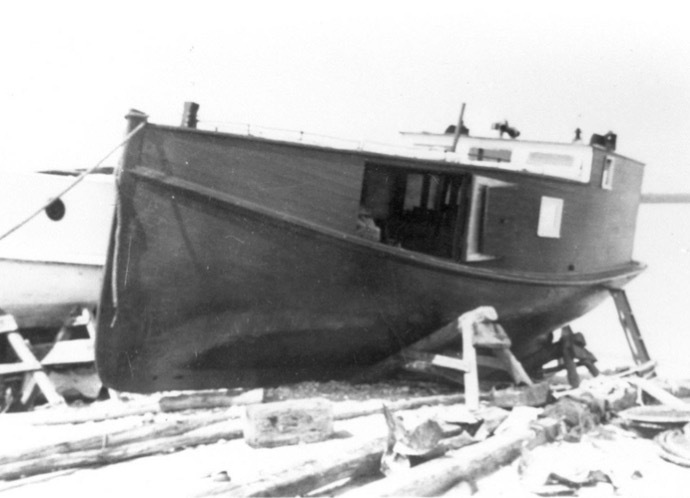 Great Lakes commercial fishing boats evolved in response to technological advances and changes in the rules and regulations governing commercial fishing. Explore the variety of fishing methods – past and present – deployed by fishermen to follow the fish! 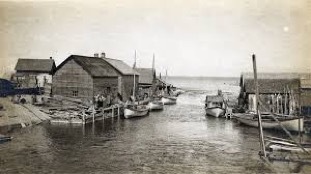 Fishing from ShoreThe Anishinaabek and their ancestors and early settlers fished largely from shore and at the mouths of streams and rivers from canoes or using hand methods such as traps, spear fishing or wading with seine nets that could be pulled by hand in shallow waters. These methods are still regularly used today. Today regulated spear and bowfishing seasons are open for many fish species; and quiet water kayak and canoe fishing grows in popularity. Seine fishing still often used to capture many minnow species important to bait industry supplying recreational fisheries. Mackinaw Boats These 20-35’ seaworthy wooden sailing boats were considered the ‘pickup trucks’ of their time for their versatility in use and ability to work in shallow water and off the beach. For independent fishermen in the 19th and early 20th century working pond and gill nets, mackinaw boats were ideal, affordable watercraft. Thousands of mackinaw boats were built by Anishinaabek and non-native boatbuilders for fishing and general transportation. Pound/Pond Net Boats Any small boat could be used to harvest the catch from a pound net. Farmers and other lake-shore dwellers built simple boats to harvest a catch from their near-shore pound nets fish to feed their families and neighbors. The wood flat-bottomed pond net boat with one or two rowing stations was inexpensive and simple to construct. Pound or Pond Netting Fishermen with simple equipment and small boats could work the near-shore fishing grounds with these standing nets. Fastened to stakes, these nets funneled fish into a pen that could be emptied by fishermen working in small boats. Boats that could be rowed (hand-powered) or sailed (wind-powered) offered ability to set and empty nets farther from shore. The Great Lakes Gill Net Tug & Gill Nets The enclosed gill net and motorized tug was designed for gill net fishing methods dominated commercial fishing activities through the late 19th and most of the 20th century. Made of wood and later by steel, the entirely enclosed Great Lakes’ fishing tug represents a design unique to the Great Lakes. The ‘turtle backs’ tugs, as are were often called, allows fishermen to pull, empty and reset gillnets in the coldest icy and often rough waters of the Great Lakes. This signature and seaworthy design was found throughout the Great Lakes region. 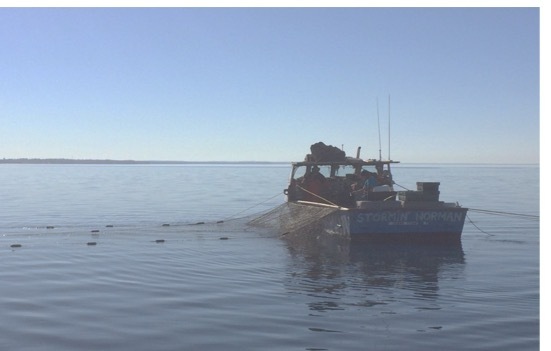 Gill nets are size-selective, meaning the panels of the gill net are designed to allow fish to swim partially through square mesh before the girth of the fish causes it to become entangled. Gill nets could be said to look like a fence that stands or is suspended in the water. Weights are attached along the bottom of the net and floats attached to the top of the nets keep it upright. Trap Net Boats & Trap Nets In the 20th century, Great Lakes fishermen invested in tugs that were designed to set and pull trap net. These boats had a small cabin at the bow and flat open deck with low sides that allowed the fishers to pull their trap net on emptied, then reset. Fish boxes were stacked and secured on the deck. Wood trap nets boats were replaced with steel boats. A trap nets a funnel fish into an enclosed box net (i.e. trap) where they can still swim freely prior to being retrieved. A trap nets allows undesirable fish, due to size or species, to be released without harm when the net is retrieved. References: Great Lakes Seaway Trail, Inc.; The Ohio State UniversityCenter for Folklore; Michigan Sea Grant. Leland's fleet of Mackinaw Boats in the Leland River., c. 1900. The Fishtug Violet hauled out on South Manitou Island, MI. 1920s. 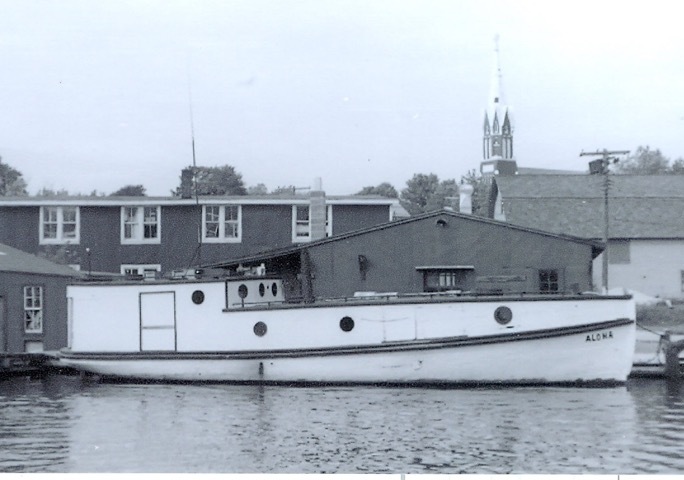 A website documenting fish tugs of the Great Lakes, including modern and historic images of the Great Lakes fishing fleet. A website devoted to Great Lakes fish tugs and commercial fishing.